Early one morning when the sun came out, Six woolly wombats went walkabout. This whimsical counting poem follows six brave little wombats on walkabout in the Australian outback. But the wilderness is bound to bring more excitement than an innocent counting game. Soon enough, the curious wombats learn to beware the hungry dingo! 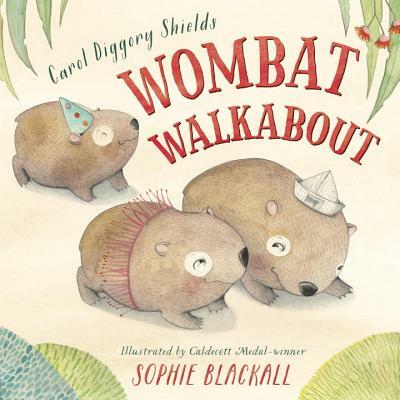 Caldecott Medal-winner Sophie Blackall's delicious illustrations set the adorable wombats in a lush world of golden wattles, billabongs, kookaburras, and gum nuts. With marvelous wordplay and irresistible read-aloud phrases, this ingenious text from Carol Diggory Shields is sure to become a well-worn favorite. Accompanied by a short, simple glossary of Australian terms and wildlife. Carol Diggory Shields is the author of popular collections of poetry for young readers, including Lunch Money and Almost Late to School. A former children's librarian and storyteller, she lives in Salinas, California. Sophie Blackall is the Caldecott-winning illustrator of many distinguished picture books, including Finding Winnie, Big Red Lollipop, and The Baby Tree. She is the illustrator of the popular Ivy & Bean series, and she also collaborates with John Bemelmans Marciano on the Witches of Benevento series. Finder her online at sophiblackall.com.